Toe Each His Own: Growing up, Mike Connor always wanted a pony. Now he wants this sloth. No dice. The Museum of Natural History hosts real live wild animalslike sloths! God, we love sloths. Once upon a time, nature shows were hypnotic fare. In subdued tones and scientific language, the usual deep baritone of the narrator detailed the often gruesome struggle for life: lions hunting their prey; jackals feasting on their kill. Hours slipped away with nobody even noticing the bowl was cashed. These days, Animal Planet is just a vehicle for "Funniest Home Videos" shows and zany jump-cut malarkey like the Crocodile Hunter. Granted, it's my favorite show, but still, the antics to which these shows resort to hold a kid's attention are downright dizzying. Enter Steven Karlin, executive director of Wildlife Associates. At a presentation for the Museum of Natural History on Saturday, Karlin will bring the real deal to Santa Cruz: an African crested porcupine, an arctic fox, a golden eagle, a baby American alligator and a two-toed sloth. Whether he's presenting at marketing seminars or elementary school assemblies, Karlin uses a decidedly holistic approach to teach people about the natural systems on which all life depends. This weekend, he will arrive in town with a bunch of animals and a two-toed sloth named Hershey. Not to be confused with the three-toed sloth, its docile, button-nosed cousin, the two-toed sloth is a vaguely humanoid creature, yet it is more closely related to anteaters and raccoons than to monkeys or humans. It's a nocturnal, arboreal animal that lives upside-down in the rainforests of South America, hanging in the treetops from hooks on its hands and feet, stuffing itself with leaves and berries during most of its waking hours. It may also lick dew. As if the poetry of an animal whose average speed is 1/2 kilometer per hour slowly licking dew when it's thirsty is not amazing enough, a sloth's metabolism is so slow, it sleeps as much as 20 hours in a day, and only poops once every six days or sotalk about an excellent house pet! But it is at this juncture that Karlin and I have a difference of opinion. "Let's take a look at what a pet is," says Karlin, whose animals are never wrested from the wild. "Your dog is the result of 65,000 years of selective breeding from a wolf. Your cat, scientists say, is from about 30,000 years of selective breeding. So what were they breeding, and what did they have to change? They change an animal from independent to dependentan animal that has its own thought patterns and its own rules and laws to an animal that's been bred to the point that it actually wants to live with people full time and enjoys it. Wild animals are never pets." Au contraire! In some rainforest communities, sloths are kept as pets and then eaten when they reach maturity. It may sound barbaric, but given their ruminantlike stomachs that digest cellulose much like a cow, why not butcher them as such? Well, because they have the lowest ratio of muscle mass to total mass of any mammal. No meat on the bones, as they say. Plus, a moving sloth is aesthetically calming, like fish swimming slowly around a tank. Granted, I'm twisting logic into a hangman's noose for the poor critter to arrive at the "sloth-as-pet" conclusion, but let me assure you that it would be a happy one for me, and, I believe, for the sloth. If I could only get the proper permits, my sloth and I would be the happiest couple since B.J. and the Bear. And our affair will be no mere brain-rotting TV show. 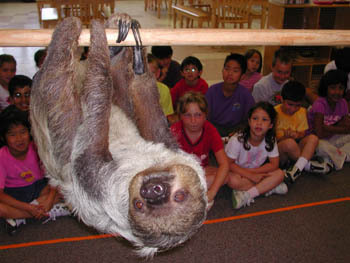 My sloth and I will love and learn from each other, as children around the Bay Area learn from wildlife presentations. "Since I got out of college," says Karlin, "it's been my focus teaching people the way the brain evolved to learn, because the brain did not evolve to learn by lists and computers; it evolved to learn directly from nature." Wildlife Associates appear on Saturday, June 12, at 11am and 1pm at the Louden Nelson Community Center, 301 Center St., Santa Cruz. Tickets are $10/general, $8/students and seniors, $7/ museum members and kids 12 and under. Call 831.420.6115 for tickets. For more info, visit www.wildlifeassociates.org. From the June 2-9, 2004 issue of Metro Santa Cruz.